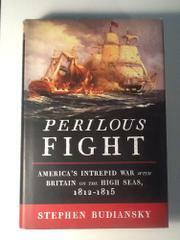 This early entry in the likely flood of books on the 200th anniversary of the War of 1812 focuses on the naval action. Journalist and military historian Budiansky (The Bloody Shirt: Terror After Appomattox, 2008) notes that 1812 has as good a claim as any American war to the title “the forgotten war”—understandably, considering that it was at best a draw for the United States. In Jefferson’s administration, the government wasn’t sure it needed a navy at all; only the Barbary pirates seemed to justify keeping a few warships. Attitudes changed when Britain, embroiled in its war against Napoleon, began raiding American ships for sailors. A British ban on American merchants trading with France also gave the U.S. a casus belli. Britain’s refusal to concede these points resulted in open conflict, during which America was effectively forced to invent a navy from bare bones. Surprisingly, American sailors gave a good account of themselves in the early going. But William Jones, recruited to serve as Secretary of the Navy, recognized that single-ship duels were a losing strategy and issued orders to concentrate on commerce raiding. Consequently, for the majority of the war, American privateers and commerce raiders preyed on British ships, from the Pacific whaling grounds to the Irish Sea. Budiansky gives a solid account of all major naval actions and a fine picture of the personalities of the key figures—especially the proud American captains William Bainbridge, Stephen Decatur and Isaac Hull, and their British counterparts. The author also looks at the fate of American prisoners of war and at the larger political issues behind the war. The Treaty of Ghent brought the war to an end early in 1815, with Britain formally conceding none of the American demands. In practice, the impressments of American sailors ceased, ending the major bone of contention. Budiansky sees the result as an early example of asymmetric war, in which a weaker power prolongs the conflict by choosing to fight only on favorable terms until its opponent grows tired of the exercise. Highly readable and especially useful as an overview of the early days of the U.S. Navy.